This buying guide has everything you need to know about buying the best inverter generator. It’s comprehensive and extensive in the actual inverter generator models we review. We feel it’s important to educate yourself before spending your money so we spend countless hours doing research so you don’t have to. We have something here for every budget and application. ✓ Note: If you’re looking for a generator for demanding electronic devices, tools, power equipment or powering your entire home when the power goes out, then you’ll need a powerful gas generator. If that’s the case then please read these articles to get you on the right track. We have many generator articles on our site but we think these links will help you find what you’re looking for. Okay, now let’s begin our generator buying guide and help you find the best inverter generator for your specific needs. Electricity is a truly wonderful thing. It is a form of energy that is clean, silent, and invisible, and yet so very powerful. This fundamental force is the lifeline of any modern home appliance, power tool, electronic gadget, or recreational device. The electricity that we use in our homes, i.e. the 120V/240V AC power which is supplied by commercial power companies, can be created from running water (hydroelectric), sun rays (solar power plants), burning coal (thermal power plants), wind (windmills), and nuclear reactions (nuclear power plants). Electricity is used to power everything from your smartphone and coffee maker, to log splitters, trains, small aircraft, and even gigantic construction equipment. Electric power can be supplied simultaneously to millions of people, stored for many years, and you can even transport it up to several thousand miles away from the source. Can you imagine a life without electricity? A life without computers, phones, lights, fans, electric grills, heaters, AC, TV, transportation, in short — a total blackout. You get the idea, right? Well that is exactly what is going to happen when the next storm or natural calamity strikes. Floods, tornadoes, hurricanes, and the like result in broken power station equipment, torn power lines, damaged transformer arrays, stuff that requires days, if not weeks to fix. And during that period, you take a trip back to the 19th century, unless you have an electric generator in the house to power all of the essential equipment such as lights, fans, heaters, phones, etc. You see, disaster never sends you a warning signal before it strikes. And the best way to deal with it is to stay prepared beforehand. You can stock all the food and tools that you need to survive for months, but you won’t be able to survive more than a couple of days without power. The worst thing you could do is go shopping for a new generator a few days before the storm hits. Because every other person in your locality will also be present at the nearest store, searching for the first generator they can lay their hands on. And generators are not stocked in the thousands like cans of tuna, nor are they designed to serve the same purpose. So instead of frantically searching for a new generator (which may or may not be right for your needs) with the help of a flashlight, inside a dark department store after the storm has hit, why not do some research and get the perfect model for yourself when you still have some time in your hands? Remember, a generator has many more uses than just being a backup power source for your home appliances when the lights go out. If you’ve ever thought about tailgating, camping, RV trips, or fishing on your own boat, can you imagine how useful a generator would be in those scenarios? You could power the rooftop AC of your RV with it, while watching the latest shows on TV and cooking some bagels in the microwave. While camping, you can use a small portable generator to power your camping equipment such as electric grills, heater, or even your laptop/smartphone. Most portable generators these days are designed to run virtually silent, and come with USB charging ports for smartphone, as well as 12V sockets on the front panel so you can easily plug your electronic equipment straight into the generator. Portable medium-sized generators are also a great way to power that electric log splitter, leaf blower, chainsaw, snow blower, or power drill. No longer do you have to be limited by the 25-foot range of an electric power tool, since you can literally throw that 50 pound generator on the back of your truck and drive it straight to the work site. Wheels and handles mean that you can comfortably move the generator around and take it with you wherever you need. If you’ve decided to buy a new generator after reading all of this, then you made a great decision! However, buying a generator, and choosing the right generator for your needs, are two completely different things. The latter requires a significant amount of research as well as some basic insight into how generators work. Don’t worry if this is your first time, or if you didn’t pay attention in science class — we are here to help you out. In this article, we shall first explain the basic concept behind the working of a simple generator. It is actually an electric motor working in reverse if you think about it. Then, we shall discuss about wattage ratings- how many do your really need? We shall also cover the concept of starting power and running power for various appliances that you use in your home. Then, we will talk about the various differences between a conventional generator and an inverter generator. After that, we shall tell you how to make the right choice while shopping for a new inverter generator. Really though, if you’re a home user and want to power your electronic appliances during a picnic, fishing trip, or RV ride, what you really need is an inverter generator instead of a conventional portable generator. We’ll explain why, and finally we cover some of the best inverter generator models currently available on the market, along with their features as well as pros/cons. So strap in and sit tight, because this incredibly interesting ride has just begun (and… it is going to be really freaking long). The new and improved EU2200i replaces the EU2000i. How Does a Generator Work? Any modern electrical generator works on the same basic principle- electrical induction. This phenomenon was discovered by the English scientist, Michael Faraday, during 1831-1832. He noticed that when an electrical conductor (wire, metal plate, etc.) is moved around inside a magnetic field, electrical pressure is created across the two ends of the conductor, and when you connect an ammeter to the conductor, you can notice a current flowing through the piece of metal. The generator can either be an AC or a DC type, AC stands for alternating current and DC stands for Direct Current. More on these two soon, but for now you need to understand exactly how the whole induction thing works inside a generator. Magnets are of two types- permanent and temporary. Temporary magnets mainly refer to electromagnets which are basically wires wrapped around a metal core. When you pass an electric current through the coils of wire, a magnetic field is generated around the metal core. It is strongest near the core, and decreases in strength as you move away from the magnet. For reference, the Earth has a pretty strong magnetic field as well but you cannot notice it in day to day life because it is too weak on the surface. However, as you go thousands of miles deep towards the molten metal core though, you begin to feel its effects strengthen (that rotating magnetic field is what gives our planets molten metal core its shape). So, if you were to take a pretty large piece of copper winding and move it fast enough, you can actually induce a current of a few mA (milliampere) in it, just with the help of the earth’s magnetic field. Rare earth magnets consist of metallic alloys with elements such as iron, neodymium, boron, etc. as the major ingredients. Electric magnets need a current supply to generate a magnetic-field, while permanent magnets (rare earth types, ceramic magnets) are always magnetized. Video | See How A Generator Work? Back to our induction principle — we know that if you move a metal wire inside a magnetic field, you can cause electrical pressure (voltage) to appear across the two terminals of the wire. But don’t expect to power your microwave or electric drill by moving a wire nearby a horseshoe magnet. The amount of voltage or current produced inside a magnetic field is directly proportional to the number of conductor elements (wires), and the speed at which they are moving (rotating). You need to wind millions of turns of ultra-thin copper wire around a laminated metal core to generate the amount of current that is need to feed the appliances in your home. Then, you need something to spin it. In the case of a generator, that spinning power is provided by an internal combustion engine. In your average portable generator, this engine is usually a direct overhead valve (OHV) single-cylinder gasoline engine- quiet similar to that of a small motorcycle engine. The larger the engine, the more watts your generator will be able to produce, since only larger engines have the power that is needed to spin bigger rotors with more coil windings and metal cores (those densely wound coils and metal cores can get surprisingly heavy). The part of a generator that contains all of these magnet poles, coil windings, etc. is known as the alternator — quite literally the same thing that your car also has under the hood. The alternator consists of two parts — a stator (static part) and a rotor (moving, or rotating part). The stator supplies the magnetic field, while the rotor spins in this field, because of which current is generated across its terminals. Video | How Does an Alternator Work? Electromagnetic Energy. So, we have three basic components in a generator — an engine, an alternator, and a fuel tank. Bigger engines = more power potential, with the need for bigger tanks in order to produce adequate running times. A generator is a means to convert conventional fuel (gasoline) into electric power (energy cannot be created, it can only be modified). It consists of an engine, alternator, and fuel tank. Larger engines are needed to produce more power, and they result in greater emissions, noise output, and weight (not very desirable qualities). Okay, those are the basics behind the working of a very simple conventional generator. An inverter generator consists of some extra parts, we shall discuss about those in the section that differentiates between conventional generators and inverter generators. But now we need to clear up some things regarding AC and DC current. Here’s the deal- the 120V outlet in your wall supplies AC power, although many appliances in your home run on DC. But wait… isn’t that a little counter-intuitive? Can’t we just generate and supply DC power to the homes? That’s a problem scientists have been dealing with since the invention of the modern large scale power generation systems, and there is a reason you get AC power to your homes instead of DC. But first, you need to understand what AC and DC are. DC stands for direct current, or stable current. If you drew it on a graph, with voltage on the Y-axis and time on the X-axis, you would end up with a straight line. Basically in a 120 V DC supply, the voltage would stay constant at 120V at any given point in time- no spikes or dips. DC current is the type of current that is observed naturally, and this is what we get from batteries. DC is natural, while AC is artificially generated. AC is alternating current, where the most ideal or “pure” form can be represented by a sine wave pattern in a voltage versus time graph. As you move the conductor INTO a magnetic field, the current on the voltmeter starts RISING above zero and goes on increasing, displaying a POSITIVE value as you bring the wire closer and closer to the point where the magnetic field is strongest. But when you begin to pull AWAY the conductive element from the strongest part of the magnetic field, the needle gradually shows an increasingly NEGATIVE value. Generating large amounts of AC power at high voltages is much easier than generating large amounts of DC power at high voltages, due to the inherent differences between the designs of DC and AC generators. Home backup vs Gas (Conventional) vs Inverter generator. On top of that, the biggest challenge is usually the part where you have to transfer the generated electric power from the hydroelectric/thermal power station to the house of a paying consumer, often thousands of miles away. That is where a STEP-UP transformer comes in. The power loss due to transportation (due to electrical resistance in wires) over several hundred miles of wire has to be compensated by stepping up the voltage of generated electricity to the order of 20-30,000 volts. And here is the important part — it is MUCH easier to step-up AC voltage compared to DC voltage, making AC power much easier to transport which is why all power generation companies supply AC to your homes. You, the end customer, receive single phase 120V AC. But, not all components of your home use AC. For example, all components with batteries in them such as cordless power tools, computers, phones, etc. use DC. These components are also rechargeable, which is why they come with a rectifier inside that converts AC to “rectified DC”. This is not true DC though, and it basically involves chopping away the negative humps on a sinusoidal single-phase AC signal. The average consumer does not carry a degree in electrical engineering, which is why we are going to present the answer to the above question in a very simplified manner. Don’t worry, because you’ll still get to know about a lot of stuff, such as clean AC power and the importance of stable voltage when it comes to powering delicate electronics. In the previous section, we talked about how generators work, as well as AC and DC. The goal of any generator, large or small, is to act as a portable power outlet. For those of you who live in the Unites States and certain Asian countries, this means 120V AC. For people from Europe as well as other parts of Asia, it means 240V AC. Remember that power (voltage x current) is still the same, since a higher voltage means that current is less, while a smaller voltage will mean that the socket pushes out more current. So a 1200 watt oven will still consume 1200 watts, no matter whether you run it off a 120V supply, or a 240V supply. How does an inverter generator work? It takes DC power, and converts it into AC power. Sounds pretty simple, right? Well, there are actually many types of inverters out there, some output AC current in the form of square or block waves, while the others output modified sine wave signals. The inverters that you should be concerned with, are the ones that output pure sine wave AC power. But here is the tricky part — inverters don’t just modify the type of signal, they also have the capability to make it cleaner. What does “clean” current mean? The power that is supplied by the power company to your home is in the form of pure sinusoidal AC signals. If you know what a sine wave looks like, then you should know that it sports a curved outline with gradually rising and falling amplitude (voltage in this case) values on a time axis. Square wave AC consists of abrupt “square” shaped signals that rise and fall instantly, giving sensitive electronics little time to react and could potentially damage circuitry by causing it to run hotter than its specified operating range. Inverters use inductors and capacitors to “invert” the input signal, and overlap the inverted signal on the original DC input, by adding in a phase shift. If this is all too technical for you, don’t worry. Basically an inverter is a means to convert low voltage DC into high voltage pure AC which your appliances can actually use. Battery inverters store DC power in a battery and discharge it by first converting that power into AC, and then stepping up the voltage to desired levels (120V or 240V). We are concerned with inverter generators, and how they differ from regular AC generators. An inverter generator is actually a simple AC generator coupled with a rectifier + inverter circuit. The alternator in a conventional generator outputs 3 phase AC that the rectifier converts into DC. This DC power is then fed into the inverter which first cleans it up and then converts it into single phase AC at the specified output voltage. The result is a stable, pure sinusoidal AC current that can be used to power your laptop, smartphone, smart TV, washing machine, etc. Basically, any modern electronic appliance that has been designed to operate on sinusoidal AC will perform at its peak only when it is fed with stable, clean 60 Hz AC power. The electricity from any inverter generator will be near identical to the main power that you get from your wall socket. On the other hand, a conventional AC generator will output choppy, low quality AC current which consists of blocky square wave signals, unsuitable for powering delicate electronics. This will heat up your phone, laptop, stereo receiver, home theater system, etc. and cause any microprocessor based low-voltage system to get damaged if used for long periods of time. Just try feeding your home theater with power from a conventional AC generator, and you’ll be able to notice the increased distortion in sound quality. It might be slight, but it will be there- —also the receiver unit will run hotter than before, and can actually cause damage or shorten its lifespan. When it comes to power output, things tend to vary quite a bit depending on the specific model and pricing. However, conventional generators are capable of delivering anywhere between 3000 to 20,000 watts of power, while your average inverter generator will be restricted to a maximum power output of somewhere between 4000 to 5000 watts. But hey, don’t jump ship just yet. With 4000 watts of power, you will be able to run the rooftop AC in your RV, while roasting a chicken in the microwave and watching TV. You don’t need more than 4000W unless you plan on running some of local power delivery service from the backyard for your neighbors. Think about it, even if you don’t own a RV and plan to use the inverter generator at home in case of a power grid failure or some sort natural calamity, 3000-4000 watts should be all you need. You can power nearly 4 fans, 8-10 LED/CFL lights, a TV, a microwave, a water heater, and a laptop with all that power. And you’ll still have some headroom for additional appliances such as a blender, toaster, etc. So even though conventional generators are capable of generating more maximum power per dollar (judging from price of the actual generator itself, not efficiency or running costs), you don’t need any more power than the high end inverter generators have to offer. If you have researched portable generators online, then you have probably noticed that the inverter generators are smaller and lighter than their conventional counterparts. However, this extra portability comes at a cost. Due to their petite size, inverter generators are outfitted with smaller fuel tanks, whose capacity typically ranges between 0.8 to 2 gallons. But do we care about who boasts a larger belly? No, we care about how much electricity we can get out of that fuel. And that is where the fight equalizes between the two, with a slight advantage for the inverter generator. It is true that inverter generators pack slightly smaller fuel tanks. However, all of them come with extremely efficient microprocessor-assisted 4-stroke engines. These engines have been loaded with all sorts of efficiency optimizations from the spark plug to the exhaust. Which is why, they deliver more power per drop of fuel in comparison to the older 2-stroke engines used in conventional generators. Conventional generators are incapable of decreasing their engine speed based on the load at the other end. A 4000 watt conventional generator will run its engine at the rated maximum of 3600 rpm regardless of what appliance is connected on the receiving end. It doesn’t care if you connect a power drill + microwave combo, or a 40 watt bulb — the engine will keep drinking fuel at the same rate. If the speed of a conventional generator fluctuates, so will the frequency of the output AC power. So with a conventional generator, you’re quite literally throwing away precious fuel whenever you are not using at least 70% of the power that it is rated at. Well then, what about the inverter generator? It features an intelligent load monitoring system that constantly keeps checking the load being put on the output, so the microprocessor can instruct the engine to increase or decrease its speed in order to conserve fuel, just like your smartphone or laptop goes into power saving mode whenever it is not being used to do heavy tasks. Thanks to the advanced power manipulation circuitry inside an inverter generator, this decrease in engine rpm levels does not translate to a fall in frequency of the output AC power. So, basically what this does is increase the amount of power that you get per unit of fuel. Meaning that, even with a smaller tank, an inverter generator can match the total running time of a much larger conventional generator. Remember the whole smart speed control thing that we talked about? Well if you think about it, the benefits are far more than just decreased fuel consumption. What it also means is that your generator will become much quieter when you are using it to power something that is not very power hungry, such as a laptop, miniature toaster, or even a compact microwave oven (600 W). In terms of efficiency, an inverter generator is the clear winner among the two because of its superior engine design, intelligent load monitoring, and microprocessor assisted operation. Not to mention the lower emissions, they greatly reduce the environmental footprint of an inverter generator in comparison to a conventional generator. Simply put, inverter generators are designed from the ground up to be much more efficient and silent in comparison to their larger, older counterparts. Conventional gas generators are inherently noisy. That’s just the way it is, but inverter generators are truly quiet, and one of the main reasons why they are worth the money. If you’ve ever sat close to a generator for any length of time, you’ll know that the noise can becoming annoying quickly. And, your neighbors might also get annoyed if you need to run your generator early in the morning or late at night. Thankfully, inverters generators are the quietest generators you can buy. Yet another clear win for the inverter generator. Even small sized conventional generators are bound to be larger than inverter generators due to their clunky engine designs and large fuel tanks. If you tend to travel a lot, or if you need a generator for camping and picnics, then an inverter generator is definitely the way to go. Most of them weigh around the 50-pound mark (dry weight), and are smaller than a 20” square box. They also include ergonomic carry handles on the top, so you can pick them up and move them around, just like a suitcase. Can you lift the inverter generator? If not, get wheels. Portability — WEN 56310i vs Champion Power Equipment 73536i. You have an appliance that is not very sensitive to current quality, and needs to run continuously for like at least 15-16 hours a day. You don’t really care about heat output, noise, etc. because the generator is going to be located at a large distance from your home or room. You’re on a budget and need something cheap for your lights, fans, heaters, etc. (All of these are not very sensitive to current quality). We have discussed the major differences between an inverter generator and a conventional generator now. But there was one little detail that we did not mention in the above section, and that was parallel operation. Most inverter generators are capable of being tethered to another generator of similar make or model via a special tethering cable that allows them to sync up their power output. So, if you take your 2000W inverter generator to the party, and find out that your friends also brought the exact same model — you can hook up both of your 2000W generators to output 2000 + 2000 = 4000W of power. The same principle applies to expandability and future upgrade scenarios. If you find out that your 3-year old inverter generator is simply not cutting it because you have installed some new equipment over the years that draws extra power, or if you need to do some upgrades to your house/RV, you can simply buy a second generator of the exact same model instead of scrapping the previous generator completely. In the end it is all up to you, do you want one single unit that generates all of the requisite power, or do you like to have the capability of splitting up your generator space into two separate, independent, portable units, with each one generating a portion of the maximum power. Keep in mind the fact that two generators working together to generate “X” amount of power will usually consume more fuel than a single generator that has been designed to output the same “X” amount of power. Also, your noise output and emission signature is bound to go up. Some cities have strict rules regarding noise and pollution levels, so you might want to look those up unless you want to be visited by a bunch of angry neighbors who are not particularly fond of the little engine concert in your backyard. 1.0 Gallon Fuel Tank Runs for 8 Hours at a 25% Load. Example : The Westinghouse iGen2500 is engineered with a Double-Insulated Acoustic Enclosure, Asymmetrical Cooling Fans, and Low Tone Mufflers to Reduce Operating Noise. In designing a quality inverter generator, each manufacturer comes up with innovative solutions to reduce noise. Westinghouse manufactures high-quality generators that are both affordable and quiet. Choosing the Best Inverter Generator (for you)? Since we have covered the working of a generator, as well as the various differences between an inverter generator and a regular generator, it is time to tell you how to select the perfect inverter generator for yourself. Note that even though we say inverter generators, most of the points that we are about to mention below will also apply to conventional generators. There are many models out there, and every manufacturer will try to make it look as if their generator is the coolest, meanest, and smartest one in town. Remember, do not fall for their marketing tactics. They will often use long and cool sounding words for rather simple and basic functions that almost every tier two unit has these days. For example, company “X” may call their automatic engine speed regulation “Eco Smart”, while company “Y” will choose to call the same “7th Sense”.Just make sure that the unit you’re purchasing is built solidly (most Yamaha, Honda, Champion, and WEN units are), with easily available spare parts and a good in-class warranty. Check out the features, and always get a generator that is easy to maintain and run. Fuel efficiency and noise levels matter as well, so check out the quality of the engine installed in your generator. Honda and Yamaha engines are extremely trustworthy, and other reputed generator manufactures even source their engines from these two manufacturers. Well, let’s face the truth — unless you live off the grid or in the middle of nowhere, most of your generators lifespan will be spent in storage. You will only take it out when you plan to go tailgating, fishing, on a RV trip, picnic, or when the power supply is out. And that amounts to a few hundred hours a YEAR. So, what happened when the generator sits under a weatherproof sheet inside your barn or garage? Fuel may leak and evaporate, clogging the fuel system. To deal with this, you normally drain out all the fuel and run the engine till you’re confident that not a single a drop is left in the tank, before you proceed to store the generator for a long period. However, good generator models will include a switch which turns off the fuel system automatically when you shut down the engine, preventing fuel leakage or loss. Often times you will notice (or not for that matter), that when the generator has been running for quite a long time, it begins to rattle or emit weird sounds all of a sudden. If that is your oil supply going down, it means that the engine is not being lubricated properly and you might end up with an engine seizure. Repairing your totaled engine will either cost you half the amount you initially paid for the generator. Make sure that your portable generator comes with some sort of visual engine oil level indicator- this could be an oil gauge or LED display. Having a fuel gauge does not spare you from the pain of having to refuel the generator, but at least you’ll be able to know when you can take a break and go watch your favorite TV show, or have a snack while the generator is running. Suitcase or H-style handles for models between 30 to 150 pounds, and dual rail handles along with wheels for anything heavier than that. Even 50-100 pound models come with wheels these days so you can literally take the generator along with you wherever you go (don’t try rolling it on snow or sand- that will not work). Some models have luggage-trolley style telescopic handles on the front, along with rear radial wheels to make the transportation process super easy, even for a 100+ pound hunk of metal, plastic, and rubber. So you now know what features to expect from a decent inverter generator. But how many watts does your generator produce? Isn’t that stuff super important? Well actually that is the first thing you need to look up before buying a generator — know if it supplies enough wattage to fulfill your needs. But there is a little caveat here. Thanks to modern marketing tactics, the large wattage rating that is flashed on the front of the generator box is rarely what the generator ACTUALLY supplies. More often than not, it is the PEAK power output or starting power output — something the generator produce for the first few seconds after starting up. This number can be anywhere from 20%, to as much as 100% more than the actual continuous power supply rating of the generator, i.e. the amount of power it will actually supply consistently while running. For example, if a generator is rated at 4000W, then its continuous power supply capability is probably between 3000-3500 watts. But why do the manufacturers give us this number instead of the actual continuous power rating? Does it matter? Well we are glad you asked, because it actually matters quite a lot. Any appliance in your home that uses some type of motor has a “starting power” requirement, as well as a “running power” requirement, with the former being up to three times as high as the latter. This is not true for all appliances though, and mostly applies to stuff like fridges, AC’s, furnace fans, pump motors, etc. Notice that appliances which use motors are the only ones that are affected by this phenomenon. This is because you need a high amount of initial current to get the motor out of its idle state. Notice what happens when you open the door of a fridge? You hear a sudden whirring sound, right? That is the compressor of the fridge spooling up in order to increase the “coolness”, since you just let a large amount of hot air in from the surrounding while opening the fridge doors to take out your frozen pizza, which you’re about to put in the microwave. The same happens when you first start a fridge — the motor inside your compressor (a compressor is a type of pump) has to boot up, and it takes that little bit of extra juice for just a few seconds, in order for the motor to get out of bed and onto its feet. You must ONLY select the items which you expect to power at the same time with your generator. Make this list with the highest-load case scenario in mind. Be practical, and don’t expect to power the house with a thousand-dollar generator because that just isn’t going to happen. Make three columns, with one row per appliance. The three columns will represent- appliance name, running watts, and additional starting watts. Add up all of the “running watts” of the appliances in the first column of the list to get part A of the total. Keep this number aside for now. Scan the third column for the highest “starting wattage” you can find. Now add the value that you found in step 3, to the result that you got at the end of step 2. This is the final wattage number that you should aim for, and add in an extra 10-20% for future proofing. ✓ Note : Even if you are going to power all of the appliances simultaneously, DO NOT turn them all on at the same time, as doing so may overload the generator. That is the reason we did not add up ALL of the starting wattages to the total, instead we only took the highest starting wattage in the pool into consideration. Emergency & Backup : Refrigerator (700W), Sump pump (2200W), Well pump (2000W), Furnace (875W). Home Use : Microwave oven (1000W), Space heater (1800W), Table lamp (100W), 27” TV (350-400W), Laptop (400-500W), Desktop PC (800W), Coffee machine (1500W). Recreation : Radio (100W), Slow cooker (250W), Ceiling fan (200W), Compact television (150W), Blender (300W). Outdoor & Construction : Electric lawnmower (1200W), Hand drill (600W), Air compressor (1600W), Circular saw (1200W), 12” Electric chainsaw (100W), Edger (960W), Paint sprayer (600W), Hand sander (1200W). Recreational purposes : Electric grill (1600W) + AM/FM radio (100W) + Fan (200W) + Laptop(300W) + Cellphone (25W) + Outdoor lighting (250W) + Inflator pump for tents, rafts, etc. (50W + 150W starting)= 2500 watts. Powering your home during an emergency : 60 watt bulb (60W) + Light bulb (75-100W), Refrigerator (700W + 2000W starting), Sump Pump (800-1100W + 1300-2200W starting), Electric furnace (1000W), Electric water heater (2000-4000W)= 10,000 watts to 12,000 watts. (Might need to get a large one, or pair up two 5000 watt units). Jobsite : Halogen work light (300W-1000W) + Electric drill (440-600W + 600-900W starting) + Hammer Drill (1000W + 3000W starting) + Air compressor (1000-1600W + 1600-4500W starting) + Belt Sander (1200W + 2400W starting) = 15000-20,000W (you’ll need to pair together a bunch of inverter generators for this one). Apart from wattage, you also need to consider the other factors such as runtime and weight. Here is some food for thought- if a 1000W generator runs on “X” amount of fuel for 8 hours, then will a 2000W unit run for 4 hours on the same amount of fuel? Well, the answer is — it depends. If you connect the same 60W light bulb to each of these two units, you will surprised to see that the 2000W unit will consume nearly the same amount of fuel as the 1000W unit, per second. This is because inverter generators actually reduce engine rpm to increase efficiency and decrease noise levels, depending on the amount of load connected. So even though the larger 2000W unit has a more powerful gasoline engine installed inside (say 250CC versus 125CC for the 1000W unit), it will actually spin at the same rpm as the smaller engine when connected to similar loads. Yes, it will consume a TINY bit extra fuel because of the heavier piston, crankshaft and rod, but the heavier flywheel will also give it more momentum so it will actually consumer nearly the same amount of fuel as its smaller cousin at the exact same rpm. However, if you run both the models at maximum load then the one with twice the capacity will probably consume much more fuel per second, meaning that you need a larger fuel tank. Take note of the following two parameters- run-time at 25% load, and run-time at 100% load. Also note the minimum as well as maximum noise levels. For maximum efficiency, we recommend that you use at least 25% of the generators maximum continuous power output while it is running. Alright, that’s enough talk regarding inverter generators and how you can choose the right one. Now let’s take a look at the cream of the crop when it comes to inverter generators- the following models rank among the best in the market and are definitely worth looking up if you’re in need of a new inverter generator. We have also listed the main features and specifications of each unit, along with its pros and cons to make the selection process easier for you. Excellent build-quality. Designed to be used for a variety of applications. If the WH2400i looked good to you, then you’ll surely love this one. It is a specialized version of the 2400i, with some modifications. The running wattage has been reduced to 1800W, and the starting wattage is now 2200. However, you’ll find that this is still enough to power your home water heater or microwave, while running a couple of low power light bulbs at the same time. Or, you could use it to power an electric chainsaw and power drill simultaneously. Do the wattage calculations and decide if this little 43-pounder can power the equipment that you plan to use most frequently with a portable generator. You should know however, that the runtime on this model is 13 hours, compared to the 11 hours on the 2400i. That is probably because of the more advanced micro-controller design, or maybe Westinghouse just refined that 79cc single cylinder 4-stroke engine to become even more efficient than it already was, since both the 2400i as well as the 2400iXLT use similar engines. Engineered to keep cool under heavy work loads. Fuel tank capacity is 1.3 gallons on both of these generators, and the 2400iXLT carries the exact same sound signature as its less fuel-efficient sibling, with noise levels ranging between 52-59 decibels for minimum and maximum load respectively. Warranty is the exact same 2-year limited cover, so all that differs between these two is the outlet port type, with the 2400iXLT using a NEMA 5-15R instead of the Duplex 5-20R for 120V AC output, and the 2400iXLT runs about 15-20% longer while generating slightly less (about 10%) peak and running power. ✓ View or download the SPEC SHEET. ✓ View or download the PARTS LIST. 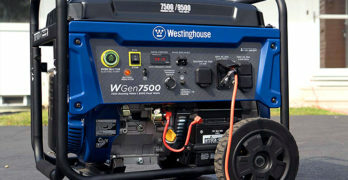 Westinghouse has been updating their portable generator lineup aggressively starting in 2017, and the Westinghouse iGen4500 is a recent model that I feel is an excellent balance between power (3700 running watts), price, features and reliability. This truly is one of the best inverter generators you can buy. This is a fantastic inverter generator for the money. Lightweight quite light when compared to Traditional Generators of the same size and features. 30-50% More Fuel Efficient Than Comparable Traditional Generators! Westinghouse has been manufacturing electrical devices since 1886, well over 125 years. When it comes to generators, they know what they’re doing. Nowadays there are a lot of manufacturers that pop up trying to make a quick dollar, but when it comes to generators I recommend you invest your money into trusted brands such as Westinghouse, Honda and Yamaha ( to name a few). To learn more details I recommend reading our indepth review of the Westinghouse iGen4500. It truly deserves your serious consideration. Ultra-quiet and professional build quality make this an instant classic. The Yamaha EF2000iSV2 is has proven itself to be one of the best inverter generators by consumers and experts — usually in close competition to the popular Honda EU2200i, which is also covered in this article. This is the new and improved model (version 2). A fantastic inverter generator just got a little bit better. Twin Tech (Parallel generator operation) – The EF2000iSv2 can be operated in parallel to deliver up to 30 amps. New controller with advanced programming – The addition of the new programming allows the EF2000iSv2 the ability to power a much wider range of applications than previous generation EF2000iS. Smart Throttle varies engine speed based on load — Improves fuel economy and reduces noise. Runs up to 10.5 hours at ¼ rated load on a tank of gas. Gasoline petcock – lets you shut off the gas to run the carb dry for storage and helps prevent stale gas problems. Fuel gauge — Easily see how much fuel remains. ✓ Run in parallel using the Yamaha ACC-0SS55-70-01 Sidewinder Parallel Cable. If the Westinghouse generators that we mentioned above are a little too costly for you, or if you just don’t need anywhere around 2000 watts, then take a look at this Yamaha. It has a dry weight of 44 pounds, so it is actually a tiny bit heavier than the Westinghouse models which actually generate more power than this one. The Yamaha EF2000iSV2 generates a peak of 2000 watts, with a running wattage of 1600. It packs a tiny 79 cc single cylinder engine, and boasts a 10.5 hour run-time on 25% load. While this may seem like a worse deal than the Westinghouse models which had a 11-13 hour runtime on 25% load, you must also consider the fact that the fuel tank on our Yamaha generator over here has a capacity of 1.1 gallons, compared to the 1.3 gallons that you’ll find on the two Westinghouse models. The minimum sound level on this Yamaha (at 25% load) is just 51.5 decibels (amount of noise generated in a quiet office/library), making it one of the quietest generators we have ever seen. Maximum noise levels range around 61 decibels, which is only a slight bit louder than a normal close-range conversation. Make no mistake when deciding which model to choose. The Yamaha EF2000iSV2 is built with the highest quality components and its reflected in the price. But if you’re looking for a professional-grade model then look no further — put this at the top of your list for the best inverter generator for your consideration. Ideal for camping and other outdoor activities. Highly portable. If you want to learn more then read our id-depth review of the Yamaha EF2000iS (version 1), which is identical, so the information is all relevant. Visit the Yamaha site to learn more about this generator. Telescopic handle and wheels make it easy to move around. Run in parallel using Briggs & Stratton 6278 parallel kit. One of the great things about the Briggs & Stratton P3000 and the P2200 is that you can connect either of them together and run them in parallel to create a flexible and powerful inverter system. Briggs & Stratton is a company that is committed to innovation and to the design of their generators. Not only do the Briggs & Stratton P3000 and the P2200 (2200 watts) inverter generators perform to meet your highest demands but they are beautifully designed and engineered for humans to use — ergonomic and thoughtful design make either of these deserving of your consideration for the best inverter generator available today. Any of the PowerSmart Inverter generators can connect for parallel operation. Okay, let’s move on and discuss the details of these fantastic inverter generators. The Briggs & Stratton P3000 inverter generator, is hailed as one of the best portable generators that money can buy. It gets its reputation from the fact that it can produce 2600 running watts, along with a peak starting wattage of just over 3000 watts, all while maintaining an astonishing 10 hour run-time at 25% load. This is partly because of the larger than average fuel tank on this unit, which comes in at 1.5 gallons- slightly more than what competing 2000W inverter generators from other brands carry. One of the other things that we love about this unit is its versatility- you can literally use it to power anything that is rated to run at 2600 watts of power or less- there are FOUR 120V AC outlets (that’s right), along with a 30A 120V V outlet so you can plug in that RV rooftop AC unit, a 12V DC outlet for small electronics and cigarette lighters, along with a USB charger for the smartphone. It comes with all the goodies that you need for safe running such as automatic idle control, fuel sight gauge, low oil auto-shutdown, and generates a measly 58 decibels of noise when heard from a distance of 23 feet. And no, that is not under 25% load like most manufacturers do in order to make the numbers on their boxes look good. In fact 58 decibels is what it actually produces while running under full load, so it definitely packs some really good sound dampening materials underneath the hood. Transporting this 84 pounder is extremely easy because of the two rear puncture-proof wheels, telescopic front handle, and dual lift handles on the top. Briggs & Stratton has been around for a long time — well, since 1908 to be precise. Originally founded on their expertise in small engines, but now they are blazing a trail with their exceptional power equipment line. The Briggs & Stratton P3000 is easily one of the best inverter generators your money can buy. 8-Hour Run Time at 25% Load. Up to 8 hours of run-time on 25% load (1-gallon fuel tank). H-handle on top for carrying around, 59 dB operating volume from a distance of 23 feet. (quieter than a normal conversation). Produces less than 3% total harmonic distortion making it safe for laptop computers, TVs and game systems. If you don’t need to power a RV rooftop AC unit, or a giant bathroom water heater, then you might want to check out the Briggs & Stratton P2200. This is the little brother of the well-known P3000 silent portable generator. The P2200 carries over all the good features of its elder brother, such as the excellent sound dampening and amazing portability, while still maintaining a ton of versatility when it comes to ports and features. Surprisingly though, this unit is actually slightly louder than the P3000 as it generates 59 decibels of noise from a distance of 23 feet. That is still in the range of a normal conversation, so you should be fine. There is one single 12V DC outlet, and dual 120V AC outlets instead of 4. Fuel gauge and automatic idle control are provided as standard, but the run-time is surprisingly shorter than the P3000 despite the fact that this unit packs a tiny 110cc engine and generates less power. This must be because of the 1-gallon fuel tank more than anything else, since the P3000 comes with a 1.5 gallon tank. It weighs much less though, and is way easier to carry around due to its 54 pound weight. However, there is no telescopic handle on the front, a feature that we really loved in the P3000. 2000 peak watts, 1600 running watts. 79.7 cc single cylinder OHV 4-stroke gasoline engine, EPA III as well as CARB compliant. Total Harmonic Distortion (THD) under 0.3% while idling, and less than 1.2% while under full load. Run-time of 6 hours under half load, 1-gallon fuel tank. Low-oil and low-fuel automatic shutdown, with indicator LED’s, and overload protection. Supports parallel pairing via special tethering ports. Measures 22.25” x 12” x 19.25”, and weighs 54.4 pounds. EPA III and CARB Compliant. ✓ View or download the MANUAL for the WEN 56200i. WEN is one of the most reputed generator manufacturers, and their build quality never fails to impress. Even on a budget mid-tier model such as this 1600W unit, they managed to cram in a lot of amazing features. The 56200i has a starting power of 2000 watts, along with a running power of 1600 watts. THD (Total Harmonic Distortion) is under 0.3% at idle, and less than 1.2% at load — this is an indicator of how clean the output sine wave is. It is almost as good as the mains supply which you get in your homes, if not better. There are 3 dual-prong 120V AC outlets on the front panel, along with a single 5V USB port and a 12V DC outlet. Run-time is an impressive 6 hours under half load, thanks to the 1-gallon fuel tank (pretty standard for 1600W generators). There is plenty of protection features on this little 54-pounder, such as overload circuit protection, both low-oil and low-fuel auto-shutdown, along with indicator LED’s to show the status of load, oil levels, etc. We would definitely put this one on the heavier side, as there are plenty of Yamaha and Honda models out there that generate the exact same amount of power but weigh anywhere between 10-12 pounds less. But hey, it must be the superior build quality of WEN generators, because these guys only use thick gauge aluminum and steel sheets with plenty of secure mounting for the internal parts. WEN is a company that provides exceptional value for your money. The WEN 56200i is no different, and deserves your consideration as one of the best inverter generators available today. ✓ For more information read our in-depth article on the WEN 56200i. Heavy-duty inverter generator for people who need lots of power anywhere. 212 cc 4-stroke OHV engine creates 3100 starting watts and 2800 rated watts. Run-time of 7.5 hours on half-load, 1.85 gallon fuel tank. Ports include : Two three-prong 120V receptacles, one AC 120V 30A NEMA twist lock receptacle, one 12V DC receptacle, two 5V USB port. Total harmonic distortion under 0.3% at no load and under 1.2% at full load. Includes: Fuel gauge, automatic overload protection, built-in wheels, and low-oil shutdown. Eco Mode : Automatically adjusts fuel consumption depending on the electrical devices plugged in. Saves fuel and maximizes fuel usage. ✓ View or download the MANUAL for the WEN 56310i. What if you more than the standard 2000 watts of running power in order to power up that rooftop RV AC unit or the electric furnace in your home? Well then, you need to check out the WEN 56310i. It rolls on 3100 watts of starting power, with a running power of 2800 watts. The 3.5 horsepower 212cc air cooled single cylinder engine inside is strong enough to run a bike, but it has been optimized to sip on fuel while still delivering impressive rpm levels. Which is why, you will get up to 7.5 hours of run-time on this WEN generator at 50% of the rated load. Maybe it is because of that huge 1.85 gallon fuel tank, but there is no denying the fact that the 212 cc 4-stroke engine in this beast is really efficient for its size. There are dual 5V USB outlets on the front, along with a twist lock NEMA receptacle, dual 120V AC receptacles, and a single 12V DC receptacle. We were really impressed by the fact that WEN managed to keep the noise down to just 57 decibels at quarter load, making this only barely louder than the ultra-silent P3000, which generated just 58 decibels under half load. Even more impressive is the fact that this WEN weighs just 81.4 pounds — that is pretty impressive for a 2800 watt generator. Because of all of that, we feel that the WEN 56310i is one of the best inverter generators on the market. The Honda EU2000i has been updated and replaced by the Honda EU2200i. A classic generator is now even better. We have a lot to say about the remarkable Honda EU2200i. Ultra-quiet, well-engineered, reliable and efficient. Unless you’ve been living under a rock or in a cave, you likely have heard about the Honda EU2000i, as it is argued at length as to whether or not this is the absolute best inverter generator money can buy. And deservedly so, Honda know how to make engines and power equipment. Their reputation is more known by consumers when it comes to their automobile division, and their generators carry the same badge of quality. Ideal Uses: Light construction projects, camping, boating (shore power), street vendors, operating lights, stand-by power in case of an emergency. EU2200i delivers 10% more power than the EU2000i – enabling you to power more of what you need, in the same lightweight, compact package. Whether it’s an extra refrigerator at home, a larger saw on your construction site, a larger TV at your tailgate party, the EU2200i gives you the power to get more done. The EU2200i can operate a wide variety of appliances, such as : Microwave, refrigerators, hair dryer, small AC units, and much more. Designed for portable use at home, camping, on the jobsite, or much more. Honda EU2200i operates at 48 to 57 dBA : Less noise than a normal conversation. Great for camping (won’t disturb your neighbors), supplemental RV power and any other activity that requires quiet operation. Powered by the Honda GXR120 Commercial Series engine. Exceptionally quiet, smooth, fuel-efficient performance in a small, lightweight package. At 121cc, the GXR120 is at the top of its class. Originally developed for heavy duty construction equipment. Durable and reliable. Double your power by running two in parallel : Connect it to the Honda EU2000ic Companion generator for additional power. Optional cable sold separately. Get up to 4400 watts of power. Note : The companion generator has a 30A outlet, making it the perfect setup for your travel trailer or RV. The companion generator model is : Honda EU2200ic (“c” for companion). Eco-Throttle System : Runs 3.2 to 8.1 hours on a single tank, depending on the load. This makes it the ideal choice for overnight power, or long-time applications. Inverter technology : Stable, clean power. Produces power that is as reliable (and cleaner) as the power you get from your outlets at home. Automatic mechanical decompressor system significantly reduces the amount of force needed to start the engine. Large oil filler opening, longer spout, and larger oil drain gutter make for easier and cleaner oil changes. Oil Alert : Protects the generator by shutting the engine off when low oil is detected. ✓ View or download the MANUAL and the PARALLEL KIT GUIDELINES for the Honda EU2200i. Honda generators need no introduction. The red team packs some of the best motors in the business, along with the efficiency to match their performance. The EU2000I boasts a running wattage of 1600W, along with a peak power of 2000W. At its heart lies the Honda GX100 engine, a 4-stroke gasoline OHV motor that pumps out plenty of power while barely sipping on fuel. To give you a perspective of how efficient this generator truly is, it has a run-time of 8.1 hours on 25% load, even though the fuel tank has a capacity of just 0.95 gallons. There is a 13.3A 120V AC receptacle on the front, along with the standard USB and 12V DC ports. Light enough to take with you wherever you need power. Both the spark arrestor as well as muffler are USDA certified, which means that Honda is living up to the highest standards of quality, and it generates just 53 decibels on quarter load which is barely louder than the chirping of a small bird. ECO mode boosts efficiency at the coast of performance, so engage it whenever you don’t need all of the 1600 watts. Features such as overload protection, intelligent throttling, and auto low-oil shutdown will keep your generator running safe at all times, while the 3-year limited warranty is better than the standard 2-year warranty found on most competing models from other manufacturers. View the diagram of the major components. What is the Honda Eco Throttle system? Eco-Throttle allows the engine to automatically adjust and adapt the engine speed to so it only generates the power needed for the specific demands in that moment in time. Energy is optimized, not wasted. Most conventional generators have to run at 3600 RPM to produce 60 hertz (cycle) electricity. but the Honda EU2000i can run at much slower RPMs and still maintain the correct frequency and power for the requested load. Eco-Throttle uses a load-dependent speed control governor to automatically adjust the engine speed to run at the most efficient level. Because of this feature (Eco-throttle) the engine does not run at maximum capacity if it’s not necessary. This increases the amount of time you can run your generator because it reduces fuel consumption by up to 40%. Consequently, it reduces the emissions as well. It’s an impressive system that you should factor into your decision. Eco-Throttle also reduces the noise level the inverter generator making it one of the quietest generators available. For additional information, read our comprehensive article/review featuring the Honda EU2000i in great detail. It will tell you everything you need to know about this impressive generator. Need more power and want a Honda generator? Consider the Honda EU7000iS — a 7000 watt inverter generator that can run up to 18 hours on 5.1 gallons of fuel. If you want a smaller inverter generator than the Honda EU2000i I recommend looking at the Honda EU1000i (1000 watts) which only weighs 29 pounds, so it’s very easy to carry for most people. Visit the Honda site for more information about their full generator lineup. Best inverter generator for the money. Engine speed varies depending on electrical demand. Smart features: electronic fuel gauge, remaining run-time display, status lights and Powerbar. Start, run & stop with the innovative power dial. 80cc OHV single cylinder 4 stroke air cooled gasoline engine. PowerDial integrates start/run/stop functions into one simple dial. PowerBar monitors and displays wattage used. Run time remaining display shows how much time is left before the need to re-fuel. Electronic fuel gauge displays amount of fuel remaining. Turbo, Standard, Economy modes of operation saves fuel and reduces noise. Status Lights display ready, low oil, overload and overheat alerts. Low-oil level shutdown safeguards engine from damage. Lightweight compact design with built-in handle for easy portability. Parallel kit connects two iQ2000 inverter generators for twice the power (sold separately). Smart paralleling allows you to connect directly through the 120V outlets, no separate paralleling jacks required. Use L5-30. Amp receptacle to connect directly to RV or generator cord. 13.3A at 120V, L5-30R receptacle, 5-20R duplex outlet, no special paralleling jack needed for duplex operation. Runs in parallel to double your power. Use the Generac 6877 parallel kit. Just like the Honda EU2000i, this Generac packs some really neat performance figures. The peak wattage on the iQ2000 is 2000 watts (surprise), and the running wattage is 1600 watts — similar to the Honda EU2000i. There is an OHV 80cc 4-stroke gasoline engine in this puppy, and it manages to squeeze out a run-time of 7.7 hours at 25% load, with a 1.06 gallon fuel tank. Now, this is by no means insufficient, but goes to show just how efficient Honda engines truly are. For reference, the Honda EU2000i had a 25% load run-time of 8.1 hours, even with a smaller 0.95 gallon fuel tank. Fortunately, the Generac does have some tricks up its sleeve to compete with the best of the best. For instance, the entire front panel is covered with bright colored LED displays. There is literally an LED display for just about everything — load indicator, power bar, reset, idle control, run-time counter, fuel bar, and low oil/fuel. All of these have their own little LED lights with switches right next to them. This makes for a much more intuitive experience in comparison to the standard gauge/analog meter setup that is found on competing models. Well, did we mention how quiet this thing is? It generates just 49 decibels of sound at 50% load! That is literally whisper quiet- even libraries make more sound than that. We don’t know what magic went into this 46-pound generator, but you won’t even know it is running until you stand right next to it. To get an overview of the iQ2000 read the original press release for the Generac IQ2000 inverter generator. ✓ View or download the GENERAC TAILGATING GUIDE. The iQ2000 doesn’t get the credit or attention it deserves. Visit the Generac site to learn more about Generac generators and generators in general. Their site has a lot of excellent resources to educate you. At Chainsaw Journal, we feel it’s important to be get the facts before making a decision. We do our best to give you practical advice because we trust that you’ll make the right decision for your own specific needs once you have enough information. As we say here: We do the research so you don’t have to. But, we encourage you explore other resources because only you know what’s best for you. We aim to give you some excellent options so you don’t waste your money on garbage. That’s our philosophy. Champion Power Equipment 73536i – Compact & stackable. Unique cube design, ultra-quiet, lightweight and excellent build quality makes the Champion Power Equipment 73536i one of the best inverter generators you can buy, and well worth your hard-earned money. ✓ View or download the MANUAL for the Champion Power Equipment 73536i. Do you want a portable 2000-watt inverter generator that is incredibly silent, yet surprisingly stable and feature-packed? Well then, it is time you checked out the Champion…. generator. These guys have been manufacturing power equipment, outdoor tools, and generators since several decades so it would only make sense that their generators are among the best in the industry. For starters, the Champion 73536i pumps out 2000 watts of peak power along with 1700 watts of running power, while maintaining a run-time of 9.5 hours at 25% load. And that’s with a 1-gallon fuel tank! The engine is fully compliant with both EPA III as well as CARB in 50 states, so you can run it all day without worrying about harming the environment. Parallel operation mode is supported, and it uses a true sine wave inverter to deliver electricity that is as clean, or in some areas even cleaner than what you get from the mains supply. One of the best things about this generator is its noise suppression- both the acoustically optimized hood and low-noise muffler come together to keep noise levels beneath 55 decibels even under high load. In fact, from a distance of 23-feet this unit outputs just 53 decibels of noise. Includes a 3 year warranty. This Parallel Kit adds a 120V twist-lock receptacle (L5-30R) and a 120V RV receptacle (TT-30R). Easy to connect, no tools required. Custom design seamlessly integrates into 2 stacked Champion inverters. We have written an in-depth Buying Guide for Champion Power Equipment inverter generators so for more options and information we recommend reading it. Champion is another exceptional brand that makes a wide range of power equipment that we continue to cover here. Champion is a brand that consumers love. Noise Level – 58 dBA from 23 ft. The Champion 75531i is basically a 3000-watt version of the 73536i that we discussed previously. What has changed you ask? Well, the peak power output is now 3100 watts, and the running wattage is 2800. We have a larger 171cc Champion single cylinder 40-stroke inside this beast, which delivers up to 8 hours of run-time on 25% load with a 1.6 gallon fuel tank. Of course it is EPA III and CARB compliant just like its smaller brother, and comes with a TT-30R RV-ready outlet on the front panel- something that the 73536i lacks because it is not meant to power RV rooftop AC’s or heater units. Noise production is slightly more at 58 decibels, but this is still within the confines of the noise that is produced in a close-quarters conversation. The dry weight is nearly 84 pounds, although transportation should not be a problem due to the retractable front handles and puncture-proof rear 6” wheels. Visit the Champion Power Equipment site to learn more about the company and their top-notch products. *And watch this video from Generac, filled with practical advice. Always keep the generator at least 15 feet away from any open windows, vents, hatches, tunnels, or doors. NEVER EVER run a generator inside a closed space such as a room as it could cause carbon monoxide poisoning. Carbon monoxide is an invisible, odorless gas that is potentially fatal if inhaled in large amounts, and since it is slightly lighter than air, it will float upwards into your nose. We recommend using the generator about 23-28 feet away from the camp site, home, or work-site. This will help reduce noise levels, and protect you from inhaling any toxic fumes. Don’t leave tools on or nearby the generator, since this could harm both you and your machine. Wear protective equipment while working around the generator (goggles, earplugs, boots, etc. ), and read the owners-manual before turning on the machine. NEVER use the inverter generator in a location that is wet or damp, and don’t expose it to snow, rain, sleet, or water sprays when it is in use (unless you want to risk possible electrocution, and a fire). Don’t touch an inverter generator with wet hands, and have a licensed electrician connect the inverter to a utility circuit. Also, don’t use the inverter around highly conductive surfaces such as metal decks, sheets, steel works, etc. Never overfill the fuel tank as that could lead to overflow, and the gasoline could come in contact with hot surfaces such as the engine, cooling system, etc. resulting in a potential fire hazard. Wear eye protection while refueling and check both the fuel tank as well as engine oil compartment for any leaks before you turn on the generator (very important). Always refuel the generator outdoors, in a well-lit and well-ventilated area. Never remove the fuel cap while the engine is running. Refer to the engine oil compartment capacity before you proceed to replace the engine oil. Open up the side panels and clean the air filter every once in a while, probably every six months if you use the generator regularly, and every one year if you use it sparingly. Also check the spark plug and get it replaced every one year or so. Never operate on any of this while the generator is running (that is like the 100th time we have said that…). Check on the muffler and spark arrestor every once in a while, and make sure that you open the fuel cap as well as vent BEFORE you turn on the engine of your generator. If the load exceeds your generators maximum load capacity, its reset breaker will trip and shut down the engine. Unplug all devices, reduce the load, and push/raise the reset breaker switch to reset it. Always make sure that the choke knob is in the ON position before starting the engine, and turn it off once the engine starts. Summary | What’s the Best Inverter Generator? Always remember this- the best generator for YOU is the one that suits YOUR needs. Something that is great for the guy next to you might be totally worthless to you. Of course, power ratings play a major role in determining whether or not you should purchase a certain generator, so make a sheet of all the equipment that you expect to run at the same time, and add the total wattage to the largest starting wattage on the list. Get a model whose spare parts will be available easily- trusted manufacturers such as Yamaha, Honda, Champion Power Equipment, WEN, etc. offer great warranties and have service centers in almost every urban location. Also take note of the types of ports, and make sure that there are sufficient ports for all your devices. Fuel efficiency and noise levels might play a big role if you’re living in a society that stresses on low noise and emission levels. Get what you NEED, nothing more. The Inverter generators below this line have been discontinued since this article was written. We’re including them here for reference purposes. Generators typically have a fairly long life when compared to a lot of products that we use, such as smartphones and cars. If a generator is well designed and it has proven itself to be popular with consumers, manufacturers don’t want to mess with it, which makes perfect sense to me. So, it’s not uncommon to see a particular generator model be sold for years. The Honda EU2000i is a good example of an excellent inverter generator that has been around for years and only recently did Honda decide to update it and improve it with the Honda EU2200i while still retaining all of the good attributes that made the original so good. .3 Gallon Gas Tank Lasts 11 Hours at a 25% Load. Very reliable & well-made. ✓ View or download the MANUAL for the Westinghouse WH2400i. If you plan on getting a portable power supply for your camping and tailgating needs, this Westinghouse generator is definitely worth checking out. It packs a starting, or peak wattage output of 2400 watts and the running power output or continuous power output is 2100 watts. With 2100 watts, you could easily run a couple of outdoor lights in the night, or you can run an electric grill, fan, radio, and laptop simultaneously, and even charge your smartphone at the same time using the USB-10A port on the front panel. The 2400 watts of starting power might even be enough for some small AC units, so you might want to check out the specs on your RV’s rooftop air conditioner to see if this little 43-pounder is worth taking on your RV trips. It supports parallel pairing and the ECO mode automatically throttles engine speed to maintain efficiency, depending on the amount of load connected to the generator. A run-time of 11 hours is sufficient to last the entire day, or you can use it to power the lights and heating unit in your camp throughout the entire night. Note that this is rated run-time for 25% load, or 500 watts- which is still more than enough to run large outdoor lights, a few 75-100 watt light bulbs. Noise output is muffled well by the internally padded acoustic hood, and is a mere 52 decibels at 25% of the rated load. Even under maximum load, it does not exceed 59 decibels. For your reference, 52 decibels lies between the amount of noise generated in a library and a normal conversation, while 59 decibels is about the same amount of noise that is generated during a normal conversation between 2 people at a distance of 1 meter from each other. Note : This generator has been discontinued. Very affordable compact and lightweight inverter generator. If you need a light-duty generator to run sensitive electronic devices then this is a good choice. It’s a basic inverter generator with no bells and whistles so don’t compare it to a Yamaha or Honda generator, but if your needs are conservative then consider the iX800. For another low-cost option, consider the Earthquake IG800W (11613). It’s a 800 watt inverter generator. 850 starting watts / 800 running watts. 38cc single cylinder OHV variable rpm gasoline engine. Run-time of 3.5 hours at 50% load, 0.5 gallon fuel tank. Max AC amperage of 7.1A, rated 120V AC amperage of 6.6A. Three status LED’s- low oil, overload, and ready. Dual 120V AC 15A 5-15R Duplex outlet. FlexPower (ECO-mode) : Conserves fuel and reduces noise by optimizing engine speed. Low oil auto-shutdown, overload protection. Measures 18” x 10” x 15”, weighs 29 pounds. ✓ View or download the FEATURE SHEET iX800. Nothing too spectacular about this one — it generates 850 watts at peak, and 800 watts while running. The Generac 5791 would be the perfect companion for your portable coffee maker or electric chainsaw/hand sanding machine. Maximum amperage is a measly 7.1A, so don’t try to get too ambitious with it- the water heater is not going to run off this one. You can power two devices at once with the 120V 15A 5-15R Duplex Outlet. There are three status LED’s on the front : low oil, overload, and ready. A switch allows you to choose between standard and ECO-mode, with automatic low oil protection and overload protection built-in. Since this 18” x 10” x 15” weighs just 29 pounds, you can actually carry it around on tailgating trips and picnics fairly easily. It will power the electric grill, a compact TV or even a refrigerator.